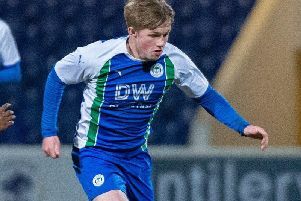 Gary Caldwell expects to have the services of Reece Burke available when Wigan Athletic return from the international break on Saturday week. The 20-year-old, who is on a season-long loan from Premier League West Ham, has missed the last four matches after injuring his hamstring in the 2-1 defeat at Norwich last month. He returned to his parent club for treatment on the problem, but is almost back to full fitness. And with Latics without a game this weekend due to the international programme, Caldwell is confident he’ll be in contention for the visit of Burton on October 15. “Reece went back down to West Ham to do his rehab, they wanted to keep him there,” Caldwell told the Evening Post. “But he’s eager to get back with us and get back with the squad. Burke is one of several Latics defenders to have been struck down by injury in recent months, with Kyle Knoyle (elbow), Reece James (ankle), Andy Kellett and Donervon Daniels (both knee) yet to kick a ball in anger this term. Daniels went under the knife towards the end of pre-season to cure a long-standing problem, but Caldwell says he is progressing very well. “Donervon’s working very hard in the gym,” the Latics manager revealed. “I beat his first score on the bike, so he’s been working really hard to put that right.